Thank you for visiting the Palmdale Water District (the “District”) website. At the District, we are committed to protecting the privacy of our customers and others who may visit our website. This notice explains our online privacy practices and how we collect and use your information at this site. This notice is intended to help you make informed decisions concerning disclosure of information in connection with the District’s website and related services. By using this website, whether you accessed this website directly or through a link from another website, you agree to be bound by the terms of this policy. The type of information we collect and this policy is subject to change. Please revisit this policy statement regularly. Our website contains links to other sites whose information practices may be different than ours. Please read those other sites’ privacy notices, and note that we have no control over information that is submitted to, or collected by, these third parties. If you do nothing during your visit but browse through our website, read pages, or download information, we will gather and store certain information about your visit automatically. This information does not identify you personally. We use this information to help us make our site more useful to visitors to learn about the number of visitors to our site and the types of technology our visitors use. We do not give, sell, or transfer any of this information to a third party. However, as a governmental agency, we are subject to the access and confidentiality provisions of the Public Records Act, and we will therefore disclose personally identifiable information as required by law, for example, in response to a court order, a subpoena or a Public Records Act request. We also may disclose such information in response to a law enforcement or regulatory agency’s request. If you linked to our Web site from another website, the address of that Web site. If you have any questions or concerns about the District’s online policy for this site or its implementation you may contact us as set forth below. Unauthorized attempts to upload or change information on the District’s web servers are strictly prohibited and may be punishable by law, including under the Computer Fraud and Abuse Act of 1986 and the National Information Infrastructure Protection Act of 1996. From time to time, we may request that you complete an on-line survey. If you choose to provide information to help us better serve our users’ needs or conduct research, you acknowledge that information provided through that survey may be shared with external third parties in ways to further the purpose of the survey, but which do not compromise privacy. 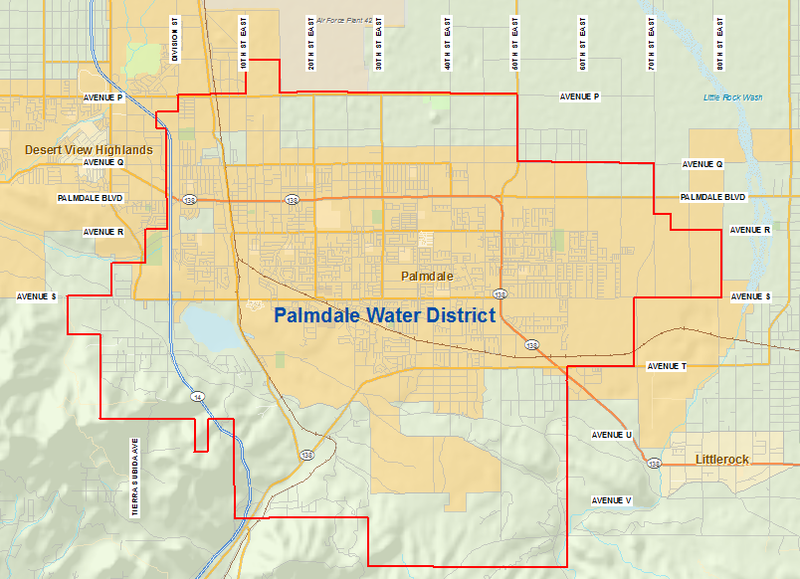 Neither Palmdale Water District, nor any of its employees, agents or individual board members, shall be held liable for any improper or incorrect use of the information described and/or contained in the District’s website and the District assumes no responsibility for anyone’s use of the information. In no event shall the District, or its employees, agents or individual board members be liable for any direct, indirect, incidental, special, exemplary, or consequential damages (including, but not limited to, procurement or substitute goods or services; loss of use, data, or profits; or business interruption) however caused and on any theory of liability, whether in contract, strict liability, or tort (including negligence or otherwise) arising in any way out of the use of this system, even if advised of the possibility of such damage. This disclaimer of liability applies to any damages or injury, including but not limited to those caused by any failure of performance, error, omission, interruption, deletion, defect, delay in operation or transmission, computer virus, communication line failure, theft or destruction or unauthorized access to, alteration of, or use of record, whether for breach of contract, tortious behavior, negligence or under any other cause of action. Palmdale Water District is a distributor of content sometimes supplied by third parties and users. Any opinions, advice, statements, services, offers, or other information or content expressed or made available by third parties, including information providers, users, or others, are those of the respective author(s) or distributor(s) and do not necessarily state or reflect those of the District and shall not be used for advertising or product endorsement purposes. Reference herein to any specific commercial products, process, or service by trade name, trademark, manufacturer, or otherwise, does not constitute or imply its endorsement, recommendation, or favoring by the District. obtained from other sites. The District’s website contains links to other related World Wide Web sites and resources. Since the District and its website are not responsible for the availability of these outside resources or their contents, the user should direct any concerns regarding any external link to its site administrator or webmaster. Due to the dynamic nature of the Internet, resources that are free and publicly available one day may require a fee or restricted access the next, and the location of items may change as menus, pages, and files are reorganized. The user expressly agrees that the use of the District’s website is at the user’s sole risk. The District does not warrant that the service will be uninterrupted or error free. The documents and related graphics published on this Web or server could contain technical inaccuracies or typographical errors. Changes are periodically added to the information herein. The District may make improvements and/or changes in the information and/or programs described herein at any time. E-mail addresses obtained through the District’s website will not be sold or given to other private companies for marketing purposes. The information collected is subject to the access and confidentiality provisions of the Public Records Act, other applicable sections of the California code as well as federal laws. E-mail or other information requests sent to the District’s website may be maintained in order to respond to the request, may be forwarded to the appropriate staff at the District, may communicate updates to the District’s web pages that may be of interest to citizens, or may provide the District’s website designer with valuable customer feedback to assist in improving the site. Individuals can cancel any communications regarding new service updates at any time.